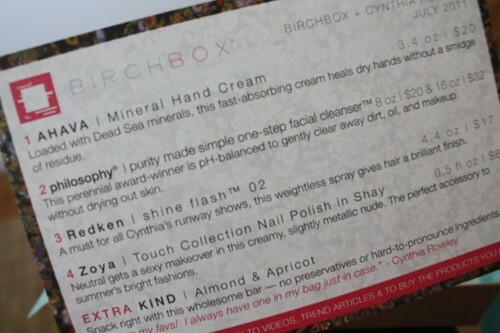 Have you heard of Birchbox? Nobody is paying me any money to say this, swear to god—none of my Splendid Things are ever, ever sponsored or given to me for free, by the way; they're just things that I've bought with my own hard-earned cash and liked—but I have become sort of obsessed with Birchbox. Basically, for $10 a month, you get a box of high-end beauty products in the mail every four weeks. The catch? Well, they're sample-sized. Generously sample-sized, though, I might add. Which really makes it not a catch at all. 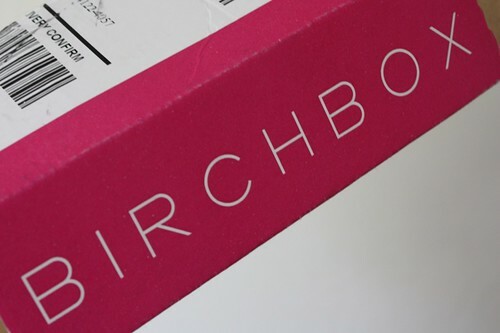 I first heard about Birchbox way back in June and I decided to sign up just to see what I thought. It seemed like a good deal—I'm a sucker for sample-sized products because they're so good for traveling, and I love to have miniature versions of all my favorites. I entered in my mailing address, paid my $10, and forgot all about it. And then, in early July, this arrived in my mailbox. Yes, that is a hot pink package. It's kind of a fun thing to get in the mail every month. August and September's boxes were just as good; I didn't take any photos of them because I was all "eh, I am an old hand at Birchbox now, it is unbecoming for me to squeal at miniature-sized bottles of nail polish" but they had some pretty great stuff in them too, my favorites being a Tarte tubed mascara ("a push-up bra for your lashes! "), a new Kate Spade perfume, some sort of hugely expensive lip gloss that makes your lips all tingly and ostensibly plumped up (though not like this, thank goodness), and a Be Fine night cream which totally lets you go to bed smelling like a rich person, so that you can imagine, albeit briefly, what it might be like to be Gwyneth Paltrow. Look, I know $10 a month is kind of a ridiculous indulgence for a box of tiny, fancy beauty products, and if I ever need to reexamine my budget and cut from it, Birchbox is obviously going to be the first thing to go, but for now, I love the surprise of getting some little treats in the mail every month. It's silly, but I get really excited when a new box arrives—I don't even let myself read the emails they send in advance, just in case I accidentally see what this month's products are; it would be kind of like seeing all my Christmas presents on December 22nd—and I relish the way they wrap everything up so prettily, so that you can just sit at your desk, with your cats as your audience, and gleefully narrate your excitement out loud as you open up each little tissue-wrapped package one by one. Uh, I mean you could. You. One. I obviously don't do that at all. This sounds so fun! It seems like a bargain too at just ten bucks per month. I would love love love to do that, but I so obsessed over having too much clutter. That I'm afraid it would just sit around and get unused and then I would have too much stuff in my house and I may have panic attacks over having too much stuff. And I wouldn't be able to toss it out because that would be wasteful and seriously that is just a downward spiral isn't it? LOL But man oh man would I love that pink box. I'm slightly jealous of your mini polish... it wasn't part my of my July box. But my October box just shipped, so maybe they threw it in that one! I am OBSESSED with Birchbox. OBSESSED. I signed up for birchbox back in June or so when I read about it in *cough*Cosmo*cough* or I mean some really intelligent news publication. I adore it! I got a friend to sign up only after I realized you get a bonus set of points for that, bummer. My all time favorite has been Pur 4-in-1 pressed powder. I swear to you, I've never looked this smooth and somewhat airbrushy. It's light, and matte and I can just throw it on an go with no foundation or concealer and I promise I'm not being paid to say this. So ten minutes ago I read this entry, and now I'm already signed up. I have virtually no beauty routine, but I do love beauty products (especially mini-sized! ), and for $10 a month it seems like a great deal. I'm kind of excited, actually! AHHHH this is really really tempting... I'm going to keep this idea on the backburner and if it still peaks my interest next week I'm going to sign up. Thanks for sharing! I am not one for fancy cosmetics, mainly because I don't want to spend the money, but this would be awesome! When I've got an extra few dollars in the budget I'm going to sign up for this. It's like a present! Every month! And you don't know what you're going to get until you open it! I love presents, even when I buy them for myself! 1.) Waaaaay back when (like, 2005) when I was making my first of several forays into match.com, you had to have a tag line of sorts. Not your username, something else. Some were REALLY bad...although that was helpful too because you could just read one (Ex: Lookin' 4 an angel) and be like, ok, nexxxxt. Mine was: Allow myself to introduce...myself. Almost no one got. 1 guy, I think. But it amused me and, really, what else matters? 2.) A friend in NYC emailed me about this last week and I signed up. I'm a beauty product whore so this was basically right up my alley. I have to wait until November for my first shipment but am thrilled to hear that someone I "know" is using it and liking it. I signed up for Birchbox around the same time that I signed up for the foodzie.com tasting box, so now it's basically like Christmas in my apartment every month. Fortunately, I live alone, so no one actually has to see how thrilled I am by the boxes of tiny things and therefore there's nothing to be embarrassed about. They do not ship internationally. I have never known misery like this. What a splendid thing indeed! I just signed up. Can't wait for my first box!! Isn't it the best!? I bought them as thank you gifts for my girlfriends who threw me a shower. It's like sending them a little thank you every month. Also...it's a great gift for for new mamas who can't get to the makeup counter with little ones in tow. A quick internet search led me to it---COSMETIQUE! http://www.cosmetique.com/ It's one or two (small) steps up from Wet 'n Wild quality. Love it. My husband would probably kill me, though. Waste of money!! But I might sign up anyway, just for a month or two, to spoil myself a little bit. If they shipped outside the US, I would sign up immediately. Do you have a "unique friend referral link" so that you may earn Birchbox points if I sign up under you? "you can invite friends to join Birchbox with your unique friend referral link and you'll receive 50 points for each friend that signs up after their first box has shipped." Oooh, please post a link if you have one! I am planning to sign up this week! Does anyone even realize how long samples actually last? YESSSSSSS. Of course, OF COURSE they don't ship to Canada. Ugh, with the number of things that they either don't ship to the Great White North or the ungodly amount of money they want when they DO ship, I wonder why we even need the internet at all up here. That would have been the perfect Xmas gift for my oldest daughter...*sad face*. To everyone nothing that Birchbox doesn't ship in your area: there is probably a local competitor that does. Off the tip of my tongue I can list EcoEmi (Intl), GoGoGirlfriend, Glymm (Canada), Glossybox (UK), Rubybox (AU) and BeautyFix. I'm sure more competitors will be popping up soon as the barriers to entry for the business are fairly low. Personally I've been a little disappointed with the Birchbox offerings of late. It seems like they peaked with the Nars box earlier this year. I think the Brits get the best of the bunch...Glossybox is really awesome. Incidentally, I don't work for any of these companies! I just researched this industry for a business school project. My 12-year-old daughter says, Thank you!! This is fantastic.....but no shipping to Canada, $@&k.
Just signed up, thanks Holly! Philosophy facial cleanser is the best - the BEST! It costs a fortune but it is absolutely incredible. oh my this looks really tempting! Holly - just found your site (from a pin of the '60 years of memories') and LOVE it. Your splendid things really are splendid! 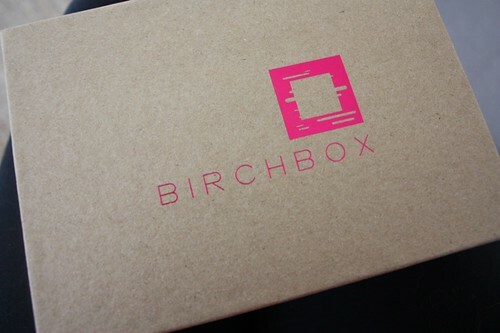 I've never heard of Birchbox, but based on the other things you love (that I love too), I should give it a try! Confession: I also love parenthesis. Wow, I wish I would have discovered this months ago! I signed up after Thanksgiving, so I'll get my first box in a few days. I hear that this month we are getting an exclusive lip gloss in birchbox pink..(spoiler *) I have been reading alot of blogs lately where customers are cancelling their subscription because the boxes have not been so great. I'm sure I will love everything being the obsessed beauty freak I am. Besides, at $10/ month, I can cancel without feeling that I've dwindled away my life savings.